The line-up is now Hillary Clinton /Tim Kaine versus Donald Trump/Mike Pence. The US has persisted with its “diversity” experiment with Barack Obama across two terms and 8 years. That experiment has not worked all that well and the US is now returning to an all-white, all-Christians election. Not a minority in sight. 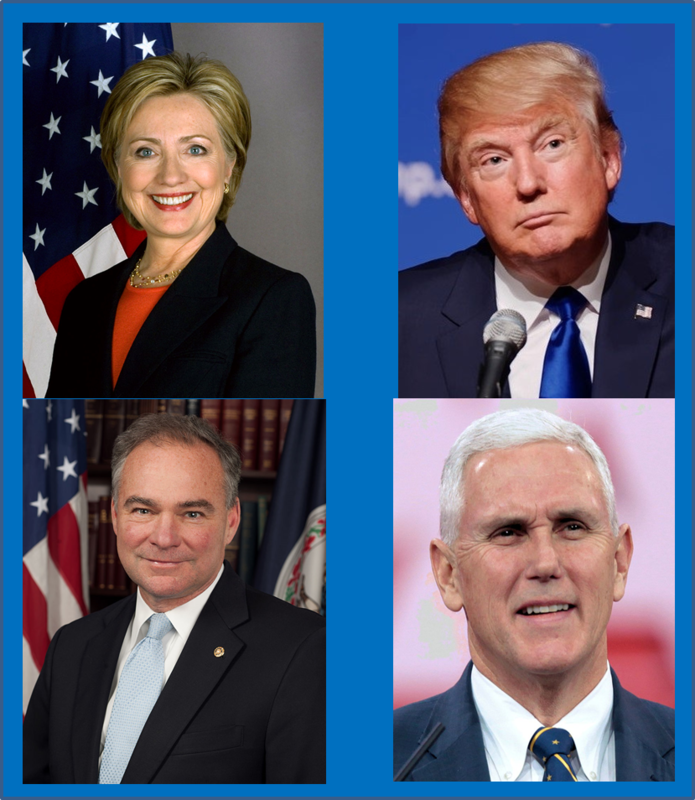 Trump is 6’3″, Clinton is 5’5″ (but her PR claims 5’7″), Pence is 5’11” and Tim Kaine is 5’10”. Trump is 70, Clinton is 69, Kaine is 58 and Pence is 57 years old. Not all WASPs, but not very much “diversity” either. Of course, if Hillary Clinton wins, she will be the first woman to be President (though women really cannot be considered a minority in the US with 97 males for every 100 females). The Trump team is 11″ taller than the Clinton team. Both teams add up to the same age. Trump is the only one with a non-politician background. Three lawyers and one real-estate developer. All straight. No giants, no dwarves. No blacks, no Latinos, no Asian-Americans, no blue-collar experience, no military service. No Muslims, no atheists, no Buddhists and no Hindus. The US has no need for a “white-supremacist” movement. This entry was posted on July 23, 2016 at 9:04 am and is filed under Politics, US. You can follow any responses to this entry through the RSS 2.0 feed. Both comments and pings are currently closed.